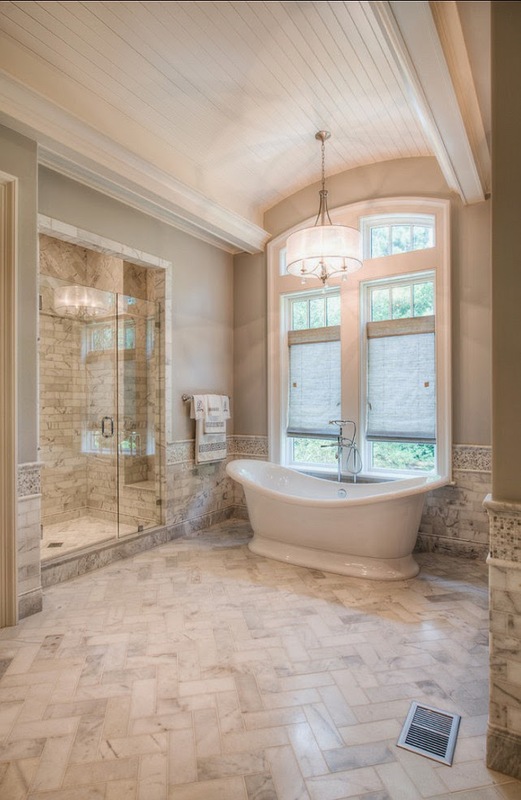 I believe that your master bathroom should be a luxurious retreat. A place to relax, be pampered and unwind. It should be utterly pretty. But how? Great question! 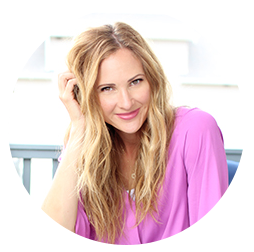 I have loved creating a beautiful space in my own master bathroom and I want you to have the same experience. 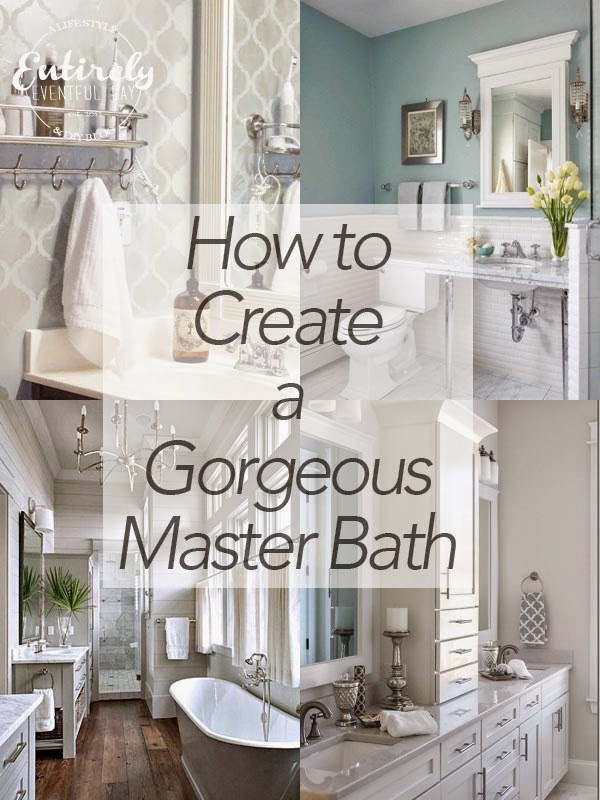 I have collected the best master bathroom ideas I could find... just for you! 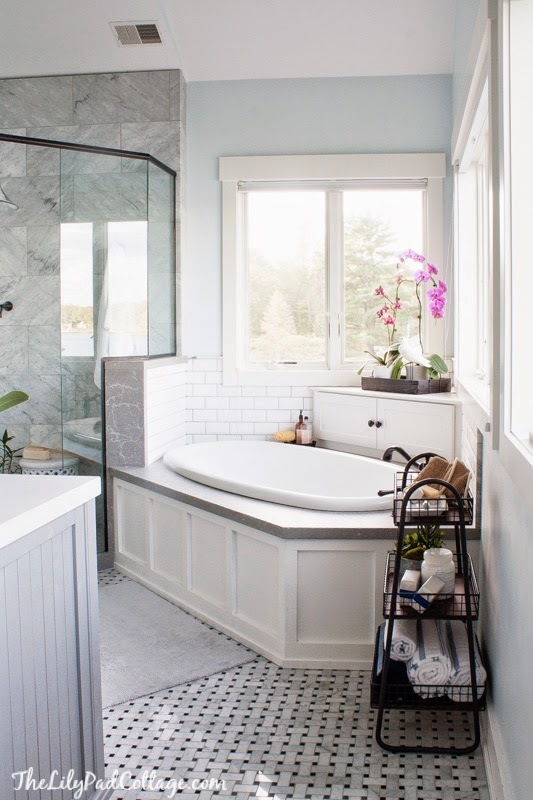 There are a few things you can do to make your master bathroom truly special. One of them is LIGHTING! LIGHTING: Simply adding gorgeous light fixtures to your master bath is going to take an ordinary room and kick it up a notch (or ever two). This is actually true of any room. Lighting does amazing things for a space. 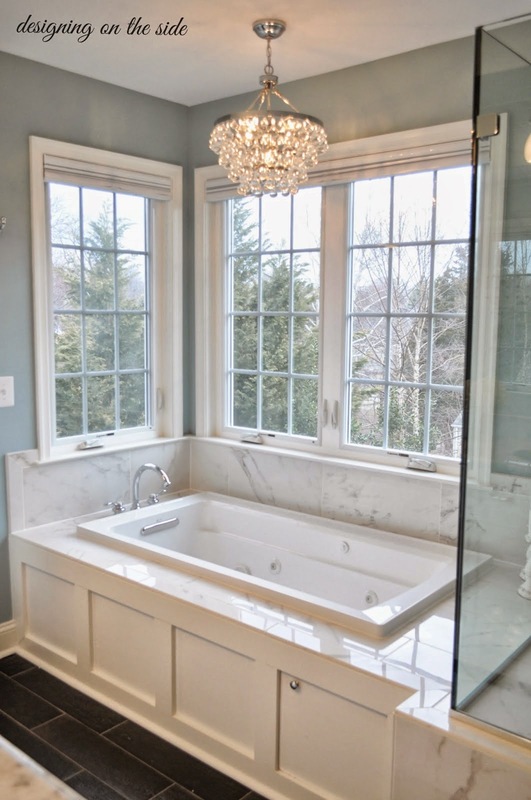 Loving this little crystal chandelier hanging above the tub. 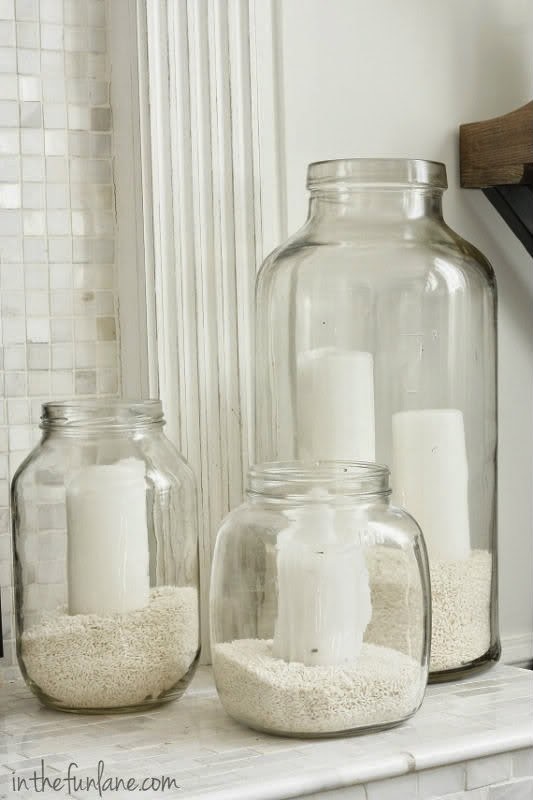 Just a little bit of sparkle goes a long way in a bathroom. These sconces are just the most adorable things I have ever seen! I wish I had room for some in my bathroom. 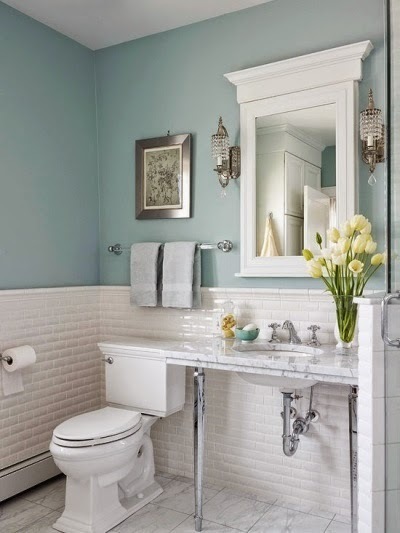 Don't even get me started on the beautiful exposed piping under the vanity! 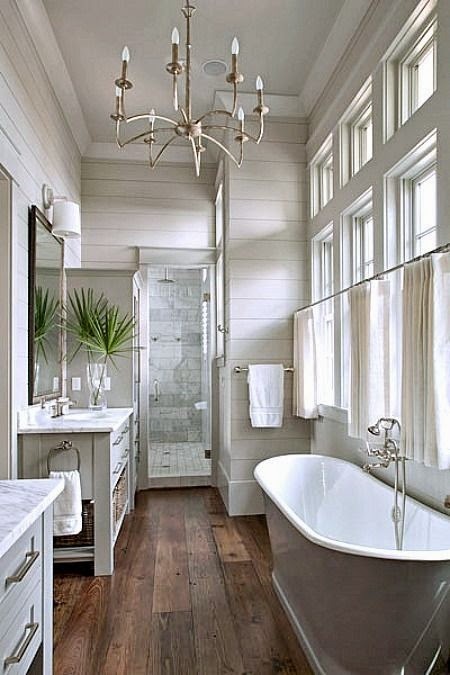 This bathroom is obviously beyond gorgeous. The flooring is absolutely killing me! But check out the lighting. It's so simple but makes such a statement and does a great job of drawing the eye up and filling the space. DETAILS: OK, let's talk about details. Keep it simple. Choose a theme and stick with it. 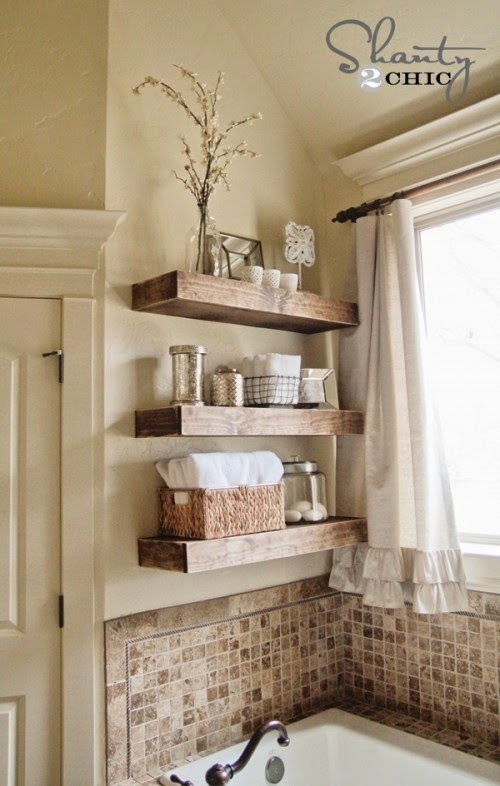 Bathrooms get cluttered enough... you don't need to go overboard on the decor. I love soothing neutral colors (gray is my favorite) and pretty linens and some interesting details to complete the look. 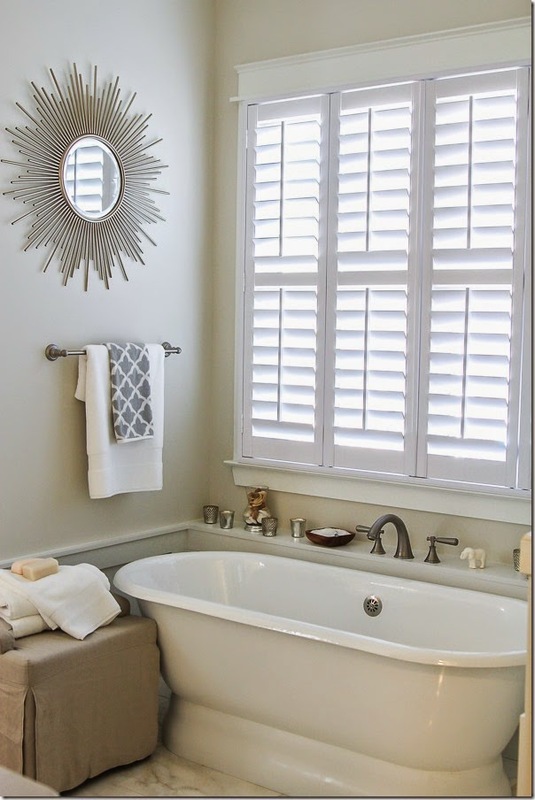 Loving this simple and neutral space with just a pop of pattern the hand towel. This is my very own master bathroom. I painted it light gray and stenciled the walls with a silver glaze. 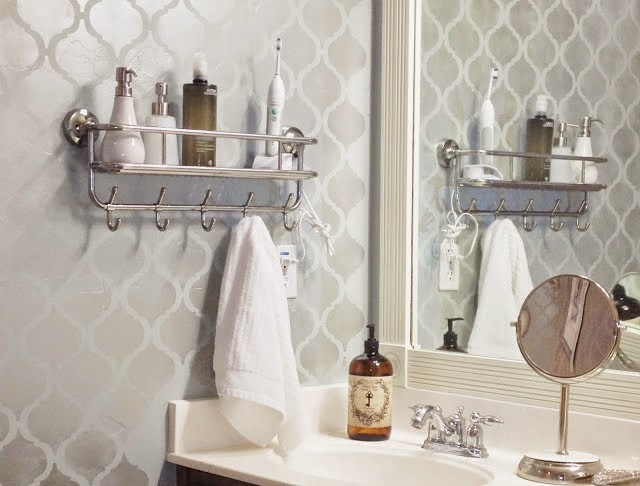 This was one of my very first blog posts so the photos are old school... but I am still loving my pretty master bathroom. 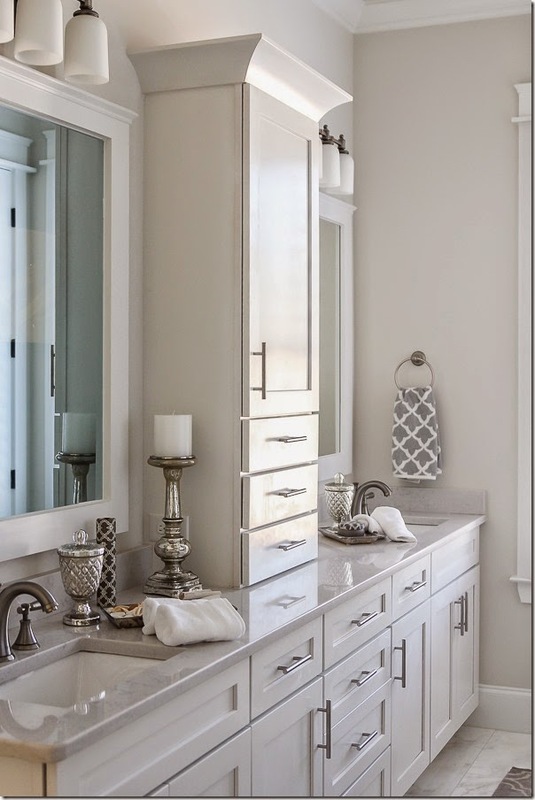 I love how they carried the theme of mercury glass throughout this vanity. The pattern in the glass echo the patter in the hand towel and the rug... so pretty and subtle. 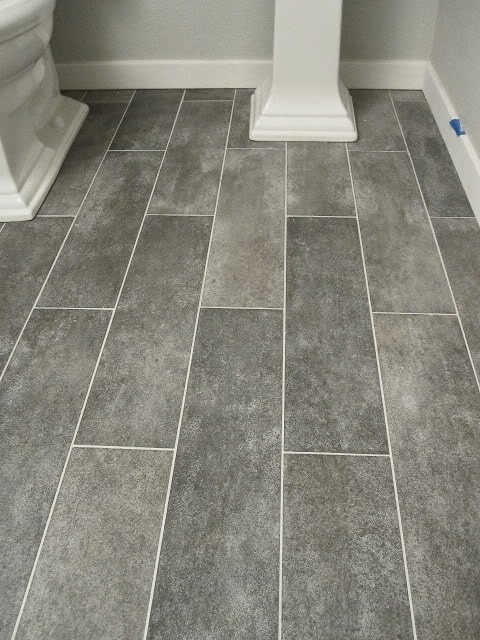 FLOORING: Now, this is obviously more work than just switching out some accessories or hanging a light but there are just so many gorgeous bathroom floor options out there these days that I had to mention a couple. I a totally digging all the shapes and textures of tile that I am seeing around. It kinda makes me want to rip out all my semi-lame bathroom tile and start all over with something amazing... kinda. My favorite options right now are the wood-look tile (above) and herringbone tile (below). Let's just appreciate how ridiculously amazing this bathroom is for a moment, shall we? Ok, now back to real life. STORAGE: Since we do live in the real world (dang it) let's talk about more practical things... like storage. I know, bummer. There are zillions of storage options out there. I love this one because it's super cheap to make and look how cute! Why don't I have this? 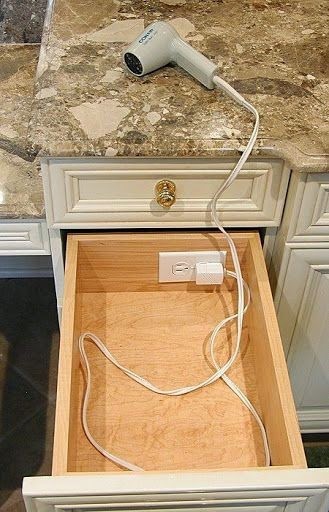 In my next life I am going to have my bathroom drawers wired with power outlets. Genius! This is another one of my very first blog post and I am still loving my DIY Crate Shelves. There are very function, cute, and super easy to do. A. This bathroom is beautiful. B. The floor is amazing. C. I'm loving the cute storage option. I hope you are inspired to go create a special space for yourself!